Challenged with timeless conflicts between industry and indigenous; entrepreneurship and protection; environment and economy; the wilderness and the wild west, DPI Territorial’s team spent two years working collaboratively with the Mikisew Cree First Nation (MCFN), a community that has become synonymous with the cumulative impacts of over 50 years of industrial development, to produce a conservation-oriented Land Use Plan. The Plan was generated through broad community engagement as part of a rigorous planning process, is based on the best available scientific information and local knowledge, and was formally adopted in a Band Council Resolution in 2015. This final step officially recognizes the Plan’s success in documenting the First Nation’s vision for conservation in the region. Implementation will occur through daily consultations conducted by the First Nation’s Government and Industry Relations office as it makes decisions on behalf of Chief and Council and the membership on changing land uses in the region. Fort Chipewyan and the Mikisew Cree First Nation are the final stop for waterways flowing out of Alberta, into the Mackenzie River to the Arctic Ocean, and the final stand to protect one of the world’s most precious environmental and cultural resources. In 2015, the United Nations Educational, Scientific and Cultural Organization (UNESCO) accepted the MCFN’s petition to list Wood Buffalo National Park (Park), which is located within the study area of this Plan, as a world heritage site in danger. The resulting land use scheme in this Plan establishes the protective buffer of conservation for the tributaries flowing into the Park that are required by UNESCO for such an endangered site. The Plan achieves a better balance between development, the protection of waters flowing into the Park, the Peace-Athabasca Delta and the biodiversity and way of life that depend on it. As such, the plan will be used as a guide for negotiations with government and industry in order to ensure that the highest priority areas for conservation remain protected, while allowing the Mikisew Cree to continue to prosper as a community, as a culture, and as a nation. The world’s largest inland freshwater delta resides where the Athabasca River meets the Peace River in northern Alberta. 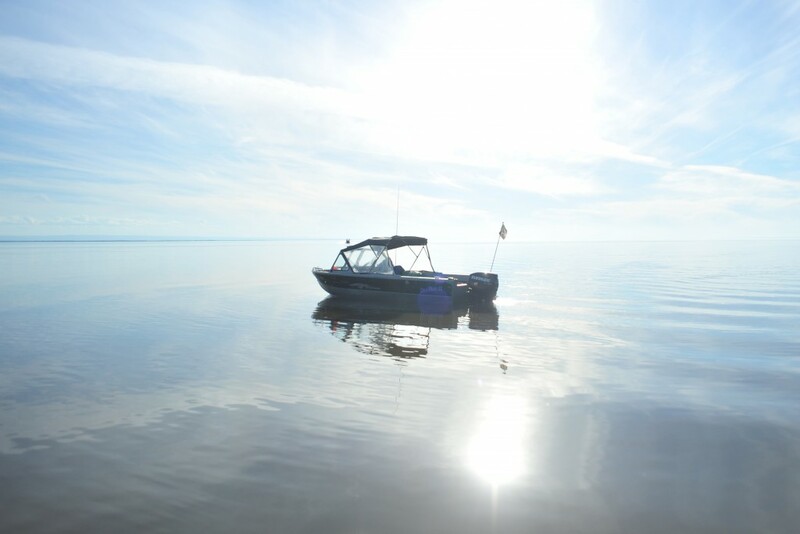 It is a glassy, waveless freshwater ocean large enough that its shores are difficult to see from a boat navigating its centre, yet it is shallow and fragile. Although the Peace-Athabasca Delta (Delta) is largely within Wood Buffalo National Park, the Park only protects a portion of the Delta’s full watershed basin. The largest lake in the Delta, Lake Claire, has been used by indigenous people in this region since time immemorial, and is fed by dozens of rivers that originate far beyond the Park boundaries. The rural settlement of Fort Chipewyan sits on rocky outcroppings that rise up from the north end of the Delta. There, members of the MCFN have another name for an important place like Lake Claire- a Cree name which suggests their knowledge of the watershed and the connectedness of the Delta with its headwaters: “Waskway Waciy Sâkahikan”, which means Birch Mountain Lake. The Birch Mountains, a magnificent range of highlands anchoring the south side of the Delta, is Lake Claire’s headwaters. Local people knew this and named the lake by its source. The watershed around Lake Claire is home to one of Canada’s few remaining healthy bison herds and undisturbed forest. In fact, it is part of the largest intact expanse of boreal forest left on earth; rich habitat for supporting populations of moose, caribou, deer, muskrat and beaver. The annual cycle sees migrating birds numbering in the hundreds of thousands each spring, and over a million in the fall. At the southern border of this important ecological refuge lies an interconnected web of industrial disturbance that has fragmented all but the most remote parts of the province. The viability of the Delta is under potential duress as the largest open pit mine in Alberta has been proposed within the Delta’s watershed, and adjacent to the Park. The cumulative impact of land use decisions over the past fifty years have produced a region that is under the constant threat of rapid environmental change. In almost all directions upstream from the Delta there exists a mosaic of overlapping oil sands, mineral, and oil and gas leases. In the Delta’s headwaters to the west in British Columbia, the W.A.C. Bennett Dam augments water flow, which soon may be exacerbated by climate change and the Site C generating station; to the south, Athabasca Oil Sands bitumen extraction is licensed to use large volumes of clean freshwater, but adds contaminants directly downstream to the Delta and up the food chain into local human populations. The entire Athabasca Oil Sands Region directly or indirectly drains into the Peace-Athabasca Delta, and Fort Chipewyan is the first community encountered downstream. The perfect storm of land use conflicts have been brewing in this corner of Alberta for half a century, and Lake Claire’s watershed sits directly in the storm path. Late afternoon rest during the construction of a hunting cabin upstream from Lake Claire. Over the course of two decades, the First Nation has built up an enormous library of Indigenous Knowledge about their traditional use of this region. Traditional land use and other cultural research studies paint a picture of long-standing and continued connection to the land and water, and dependence on its wildlife. Clearly, the First Nation is in a position to transition from cultural research to implementation; from data collection to more sustainable land use planning based on a wealth of cultural and scientific information. Far from a black-and-white, anti-development debate, some residents of communities impacted from development activities in the region such as Fort Chipewyan have come to depend on and contribute to the industrial economy of the region. 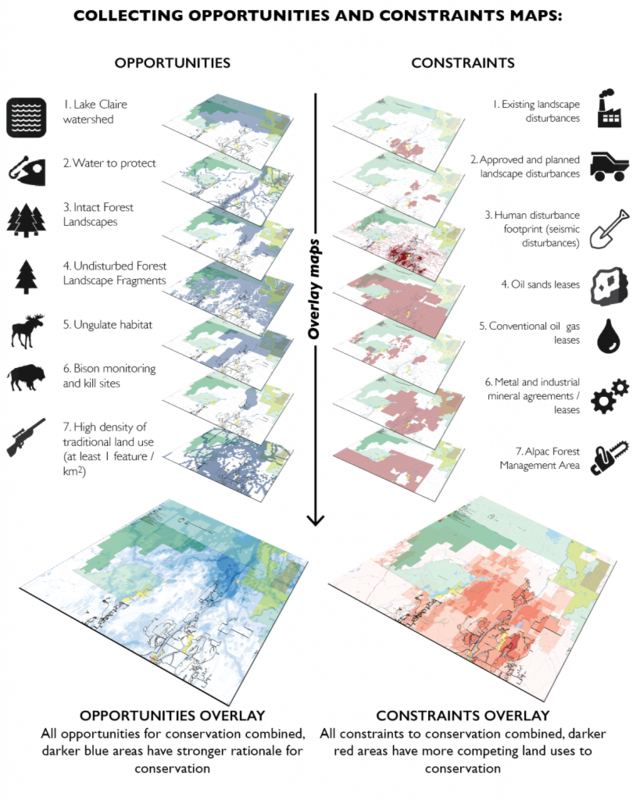 However, there are trade-offs in the current approach to land use planning and development in Alberta – there are winners and losers, prized benefits with clear impacts. Attempts to reconcile and manage these multiple demands on resources have recently been made in the provincial Lower Athabasca Regional Plan (LARP). The task of formalizing the LARP was rightfully ambitious and a necessary step for communities to prosper in the Lower Athabasca Region. However, the LARP process and resulting Plan were considered inadequate by many local communities and practitioners with experience working in the north. The LARP contains zones with varying levels of conservation, recreation as well as mixed-use zones for potential industrial development, but does not adequately protect significant tracts of land and resources important the First Nation to the as demonstrated by the completed traditional land use studies. The LARP also fails to protect significant environmental resources such as intact boreal forest and habitat, and some wildlife resources such as a bison herd. There is little evidence of integration of the Mikisew’s input in the final LARP, which was approved in 2012. It became clear that Mikisew could lead by example and provide its own vision, with strong support from its membership. The Mikisew Cree First Nation Land Use Plan: Waskway Waciy Sâkahikan provides this vision for conservation in MCFN’s traditional territory that better integrates expert knowledge, traditional land use studies, local knowledge as well as other science-based information. The vision for conservation achieved in the Land Use Plan applies to the headwaters for Lake Claire and the entire Peace-Athabasca Delta, and would also form a continuous buffer of conservation between the southern edge of Wood Buffalo National Park and expanding industrial development encroaching from the south. The Zones would provide more complete protection of these water systems, linking together existing, isolated federal and provincial parks. In addition, the Plan minimizes conflicts with existing and proposed industrial development in the region. This vision for conservation in the region directly supports not only the MCFN’s need for a unified vision for conservation in the region to apply in their day-to-day operations, but also doubles as a rigorous rationale behind the MCFN’s request to UNESCO that Wood Buffalo National Park be designated as in danger, with a protected buffer zone around it. This region is flourishing with indigenous culture and traditional ways of life, but also rapid industrialization currently occurring in Canada. The repercussions of this land use conflict affect community, environmental, cultural and economic health. Mikisew has shown that it can thrive as a modern Nation, integrating this modernity with traditional ways of life. However, this pursuit must be supported by careful and inclusive planning.